In life, there are those girls that grew up playing with barbie dolls and tea parties. And then there are some girls who spent the better part of their teen years chasing boys and learning how to apply make up to lure in said boys. And finally, there are those girls who spent their weekends and pocket allowances in the arcade, practicing their shooting and driving skills. Care to guess which girl I am? That being said, I have never had the opportunity to fire a real gun. 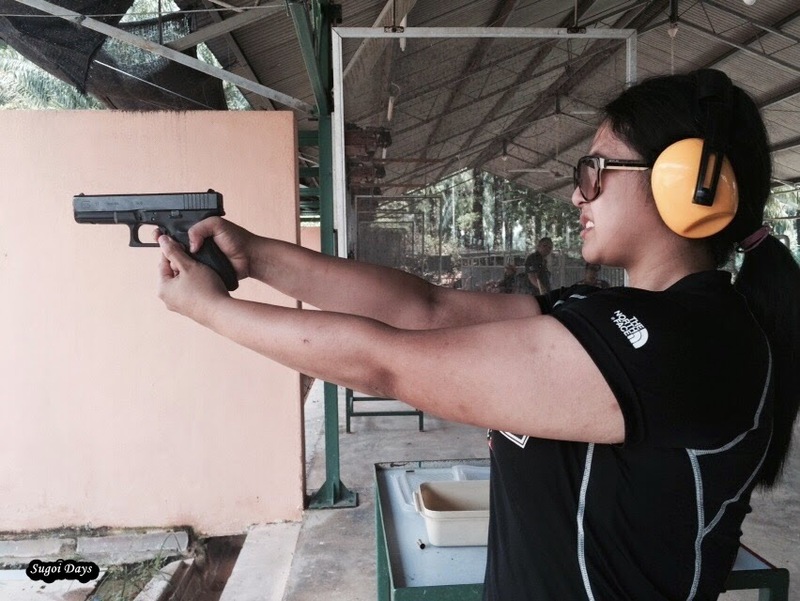 It has always been on my bucket list for the longest time ever and only recently, thanks to a few friends from Bootcamp, got the chance to learn how to fire a gun safely at a hidden location in Meru, Klang. Emphasis on the safety part because we were firing live ammo. We had to collect our ear muffs and then purchase our rounds of live bullets. Usually eye wear would be provided at the usual firing range but at this place, it was bring-your-own. My friend advised us there to bring a cap and sunglasses for protection and we found out why as soon as we started firing. But first, we had to learn the proper way to load and fire the gun. Step one was to load the bullets into the magazine clip. It was no easy task if you are doing it manually. And then the next step was to lock and load. I pulled back the hammer, steadied my aim and took a deep breath as I slowly squeezed the trigger. The first time the gun went off, it wasn't with a click or a firecracker bang or a boom. It was a loud snap with the recoil sending the gun upwards and the hammer emptying out the casing before locking in the next bullet. I blinked and gleefully fired off the next round. And the next and the next and the next. Until the gun clicked on empty and it was time to reload again. A closer check at the sheet of paper revealed that I had missed all of my first five shots but I was elated from the rush. I placed more concentration into my next few rounds and managed to hit the target consistently. Occasionally the casing would fly up and smack me right in the middle of my forehead or bounce off my head but only occasionally. My friend had it worst as it happened all the time, hence why wearing eye protection and a cap was advisable. All in all, it was an elating experience for me who has always dreamt of firing a gun and hopefully not the last. I want to thank my friends who went through all the trouble to arrange this shootout for us and while I had been expecting a one of those indoor shooting range, I was glad it wasn't because the atmosphere was just so much more relaxed.